The Asantehene, Otumfuo Osei Tutu II, on Sunday called for due recognition for the chieftaincy institution, explaining that the noble traditional organ has a critical role to play in national development and cohesion. 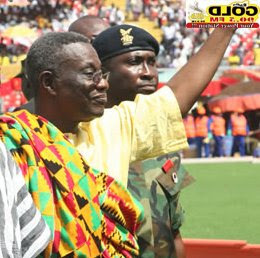 He said Ghana has demonstrated to the world that central governance can partner very effectively with traditional governance, and since his ascension of the Golden Stool as king, he and his elders have emphasized both locally and internationally, that traditional rule has a responsibility to partner central government and all its agencies. 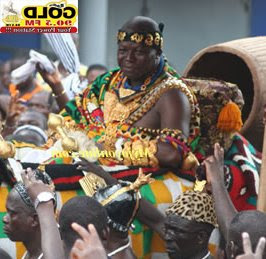 Otumfuo made the remark when he addressed a grand durbar of chiefs and people of the Ashanti Kingdom, which was also attended by President J.E.A. Mills and several former heads of states and government, including Jerry John Rawlings, Festus Gontebanye Mogae of Botswana, Olusegun Obasanjo of Nigeria, Ahmed Tejan Kabbah of Sierra Leone and Jose Mario Aznar, former Prime Minister of Spain. Dressed in splendid kente cloth and several golden adornments and carried in a palaquin through some principal streets of Kumasi, Otumfuo, also called for the celebration of African civilization for its immense but inadequately documented contribution to world civilization, said Africans must be proud of their culture. “In the past ten years, we have strengthened the institution of traditional leadership. We have used all the opportunities available to preserve and protect our culture and all its values. We have taken the institution outside the borders of Ghana and shared views and ideas with our counterparts in various parts of the world. He said apart from initiating debates at various forums on the need to position African traditions and culture in the dynamics of the globalization position. “In fact we have even proposed elsewhere that the African Union should consider giving traditional authorities in Africa, a seat in their deliberations,” he said. Otumfuo expressed disquiet over what he said was the impact of ‘modern journalism, where activities of traditional institutions such as in resolving disputes, receive inadequate coverage relative of the law courts. He said he will soon outdoor a 10-year development package, explaining that it will serve as his kindgdom’s contribution to national development. They package will include ambitious programmes for Economic Development, a Savings and Loan Agency to help small scale entrepreneurs, ICT Education among the youth and the aged, Tourism, Sports and a private Royal University. a time when the industry is expanding production on dryer machine and ball mill machines.